The Gulf region temperates during the Summer months, very rarely dip below 30C (86F) at night and often peak around 50C (122F) midday. Add to this a very high humidity and one will understand that outdoor photography in Dubai is close to impossible July till mid September. Luckily the great weather makes up for the other 9 months or so! The image above of a wheat field near Ghent, Belgium was one of the last photographs I made during my stay. I was shot on the countryside close to where my wife grew up near Ghent. I particularly like the use of the complimentary colours, blue and yellow. For those that are not so familiar with Belgium, the West side of the country consists of two provinces called West and East-Flanders, often referred to as a whole as, Flanders. Without going into politics, the "Flemish region" consists of a few more provinces beside West and East Flanders; Antwerp, Limburg and Flemish Brabant. All of them are Dutch speaking, also called Flemish. More info on the above can be found at the following wiki post. More images of my home country can be found here. 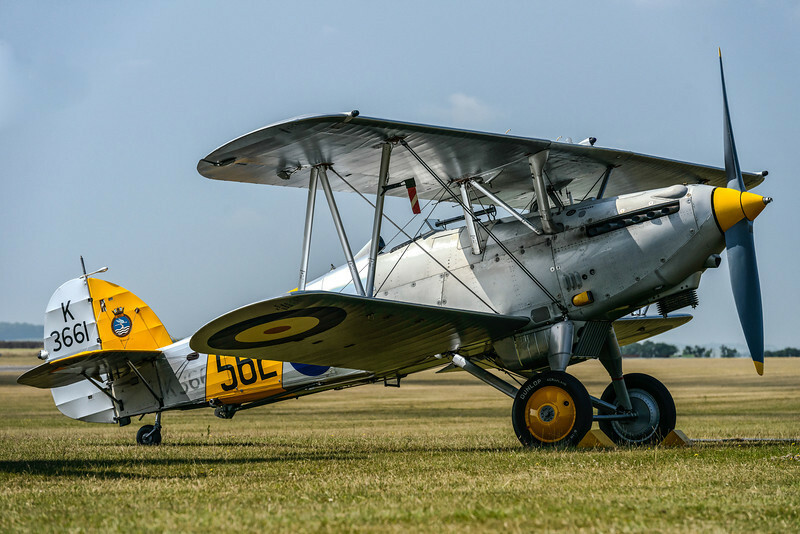 In part 2 of "The 2013 Flying Legends airshow" blogpost, we will have a look at the "flying" part during this amazing warbird airshow in the South East part of the UK. Some great images of Stephen and his good-bye display can be found at the great aviation site; Global Aviation Resource. 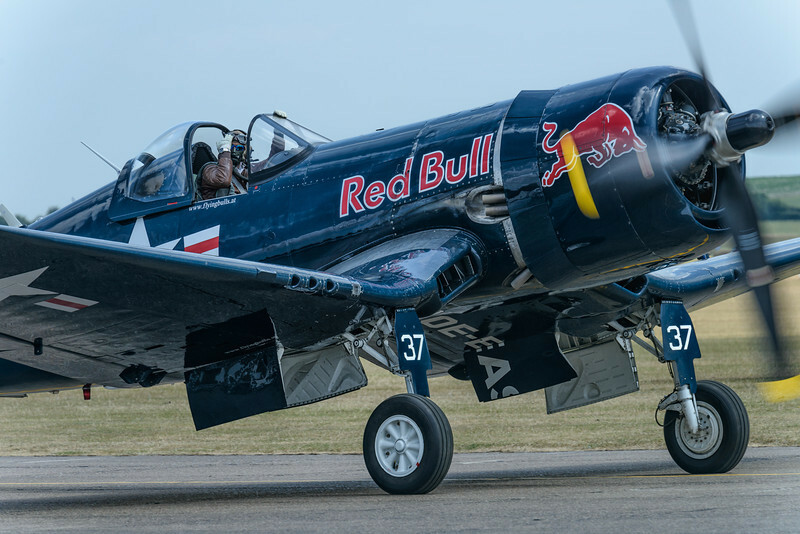 Next, were the Bremont Horsemen Flight Team; they call themselves the only aerobatic formation team flying WWII fighters. In past they have mainly flown US fighters (P-51's, F-4U's, P-38's and F-86's) and this was the first time they displayed in Spitfires. Although the display on Saturday was a bit more conservative compared to some of their previous shows, the one on Sunday was apparently more varied. 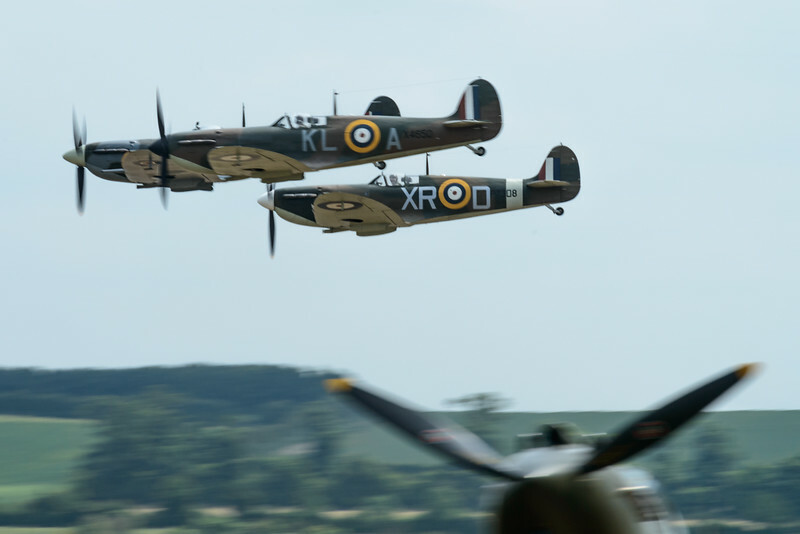 Having said this, seeing the great lines of the Spits and hearing the amazing sound of the Merlin engines, was already worth the price of admission! The flight-line at Duxford is quite long, and constantly being at the right place at the right moment is close to impossible... A Messerschmitt Me109 overflying a Curtiss P-40 starting up, is one example where it did work out! Large radial engines starting up, often come with a lot of white smoke. Catching that moment is a good photo opportunity... A shame the GA aircraft in the background, take away from the WWII feel of the shot. Seeing Europe's only flying Boeing B-17 Flying Fortress bomber was a joy! 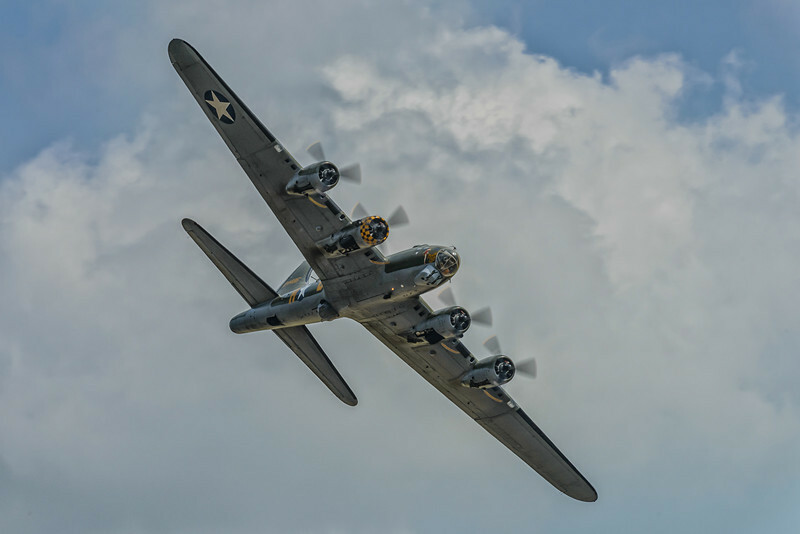 Sally B, is based at Duxford and was used as Memphis Belle in the movie titled the same. Another display I really liked where three rare Hawker biplanes flying in formation; one Demon and two Nimrod's. I was especially surprised by the very distinguished sound of these 1930's biplanes. In between a Hawker Hurricane ( see Pic(k) of the week 29 ), flew a solo display. I was hoping Red Bull would fly in their P-38 Lightning from Salzburg (Austria), but instead I had to do it with the Red Bull F4U Corsair. Its enthusiastic pilot made up for part of the miss! Some of the aircraft being displayed are very rare; e.g. the Curtiss Hawk H75C-1 above, based at Duxford, is the only one of the type still in airworthy condition! Not part of the Warbird scene, but surely not less spectacular, were the Aerostars. 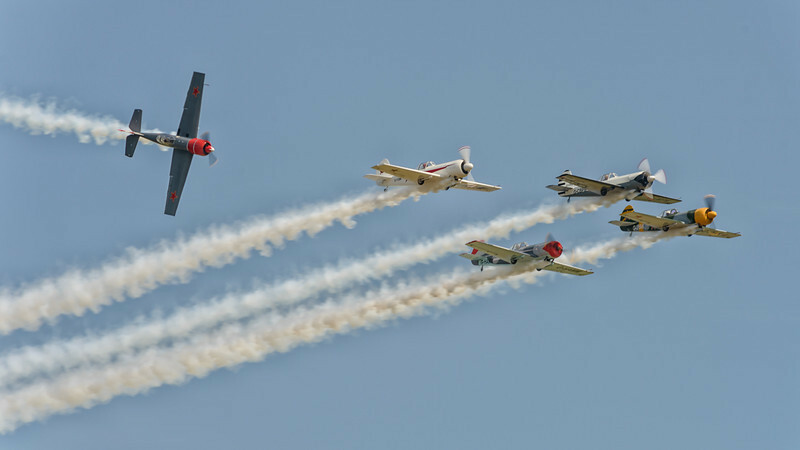 A UK based team, started in 1997 flying the vintage Yak-50 in close formation. This award winning team is a must see for every aviation enthusiast! 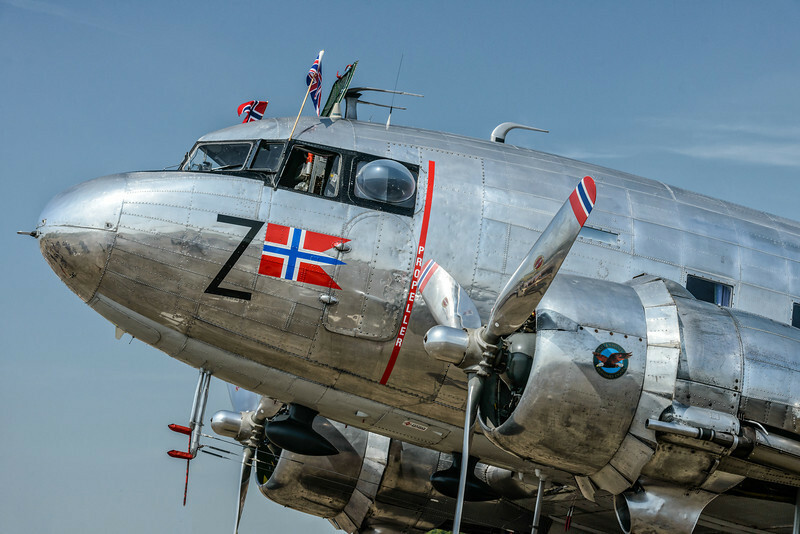 I've seen quite a few Dakota DC-3 displays over the years, but the aircraft operated by the "Dakota Norway" foundation, is by far the best one! It is a classic display where everybody walking from A to B, just stops and watches. The above description of some of the airshow acts is by no means complete. There was a whole bunch more; each and every one unique in its own way. 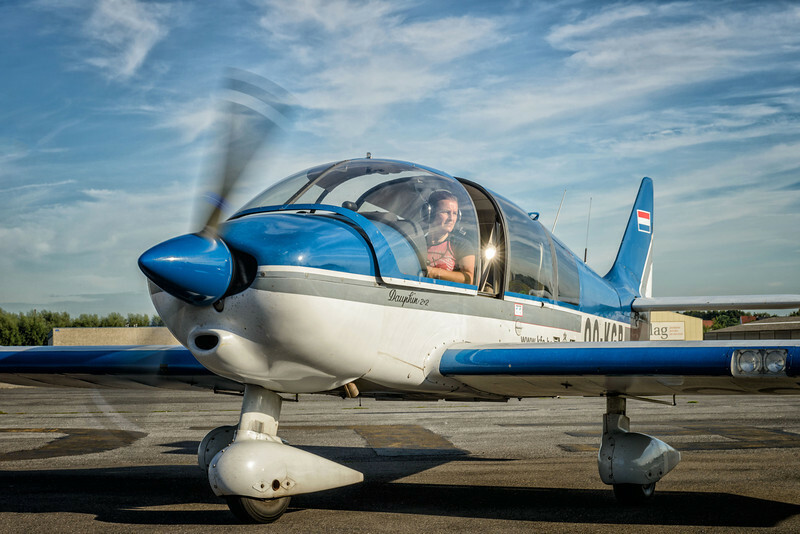 Immediately after the airshow ended, we took off in our little Robin and flew under a blue sky in 1h30' back to our home base in Belgium. 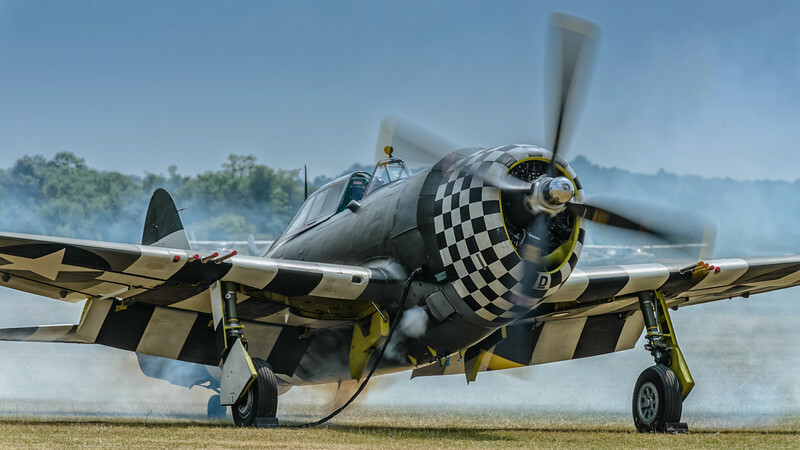 For me "The Flying Legends Airshow at Duxford, is on par with the yearly La Ferté airshow near Paris. Purely photographically, the advantage of the French show is the fact that the background is much cleaner that it is at Duxford. This might not be immediately obvious in the images above, since in most images I did remove a lot of GA aircraft in post-processing. Paying the extra 5 GBP fee for the flight-line walk, is a no brainer. 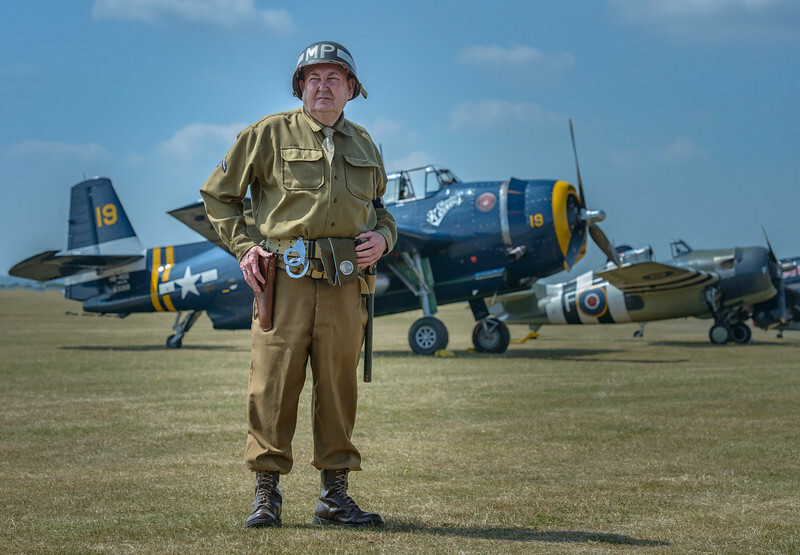 The multiple re-enactors in front of the static aircraft add to the overall WWII feel. Compared to other similar shows like La Ferté, ticket prices in Duxford are quite steep; we paid 34.5 GBP + 5 GBP (flight-line walk) per person, plus a 20 GBP landing fee for the aircraft we came in. Until midday, especially on a clear day like we were there, one is frequently shooting into the sun (backlighting). Once the airshow starts around 2pm, this improves drastically. French pilot/journalist Bernard Chabbert, who is the regular commentator at the show; really added a lot of value to the whole Duxford experience. Even though, I been using my FujiFilm X-E1 almost extensively the last six months, I did use my full frame 36 million megapixel Nikon D800 for the better autofocus capability. All of the images were shot with the 70-200 2.8 VR2, while for most of the inflight shots the 1.7 teleconverter was added for increased focal range. Overall the airshow which is often described as the best "piston engine only" airshow in the world, was a great experience and I'll sincerely hope to be back in the near future! The next large aviation event that should be cleared of my bucket list soon, is the vintage fly-inn at Hahnweide near Stuttgart, Germany; Oldtimer Fliegertreffen- Hahnweide. Hotel, rental car and flights are all booked and I should be there from September 5th late afternoon till the night of September 7th. 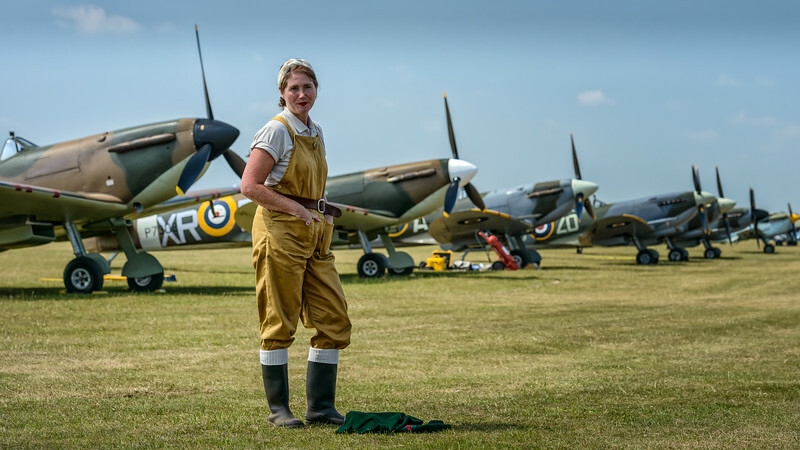 Remember; " To most people the sky is the limit, to the ones that love aviation the sky is home"
The Flying Legends Airshow at Duxford (UK), is probably the largest get-together of World War 2 aircraft in the world. Not a surprise it has been on my bucket-list for a long time! There really is no better way of getting to such a large aviation event as flying in yourself... As soon as it opened, I phoned Duxford and managed to get an 10am arrival slot for the first day of the show. It didn't take much to convince my brother in law who also holds a Private Pilot License (PPL) to join me to the party! We launched off in a Robin DR400 as soon as our home airport, Kortrijk-Wevelgem (Belgium) opened, and after a Channel covered in fog and low cloud, we landed at Duxford with a flying time of about 1h45'. Not bad compared to a 6 to 7 hour trip by car and Eurostar train! 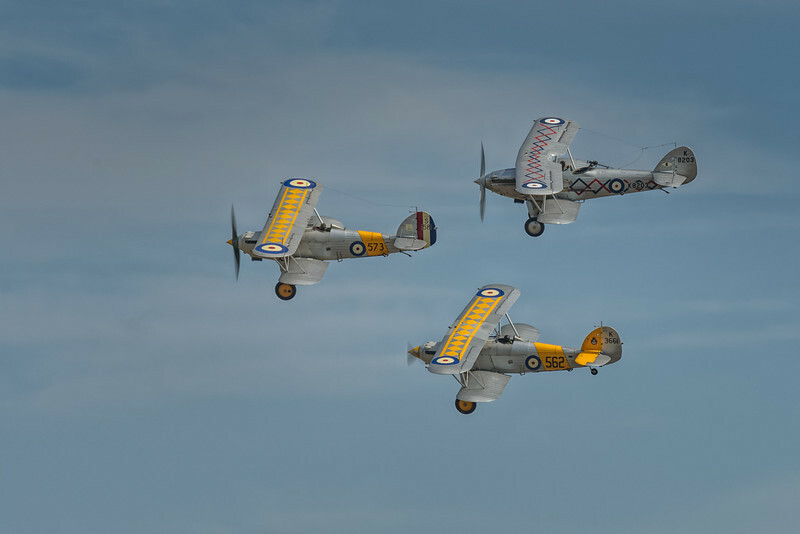 There are several Airshows at Duxford year round, but the Flying Legends one, is by far the most popular one! The airport also has a great aviation museum on site, which is worth a visit on its own. After we payed our landing and admission fees, we decided to pay the extra 5 pounds for the flight-line walk; allowing us to get better shots of the aircraft displayed on the static display until 1230 (just before the start of the airshow). The image of the Hawker Nimrod above clearly shows how valuable paying the extra 5 pounds is! 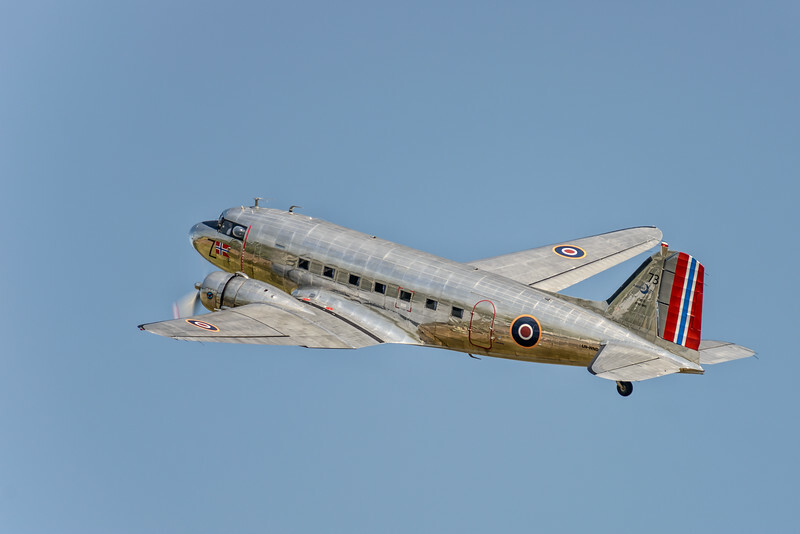 Dakota Norway, flew in this greatly restored/maintained DC-3. 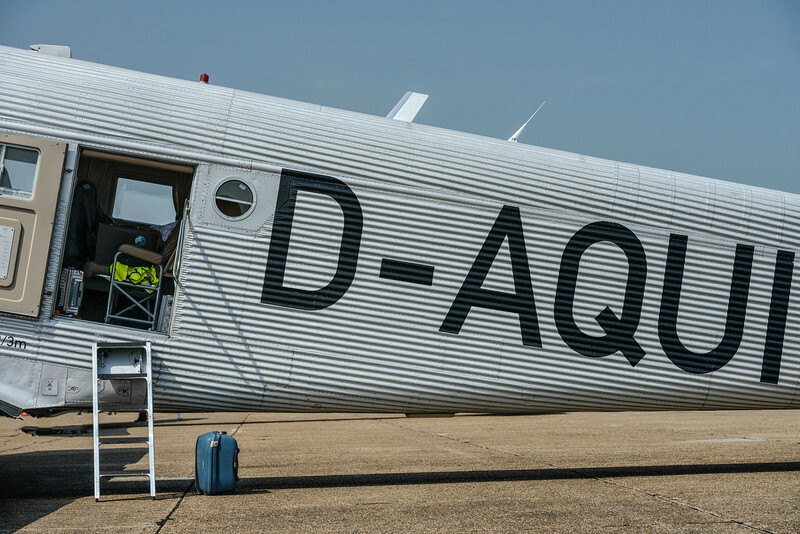 Another interesting transport aircraft was the German Jünckers JU-52 ( nicknamed Aunty Ju ) operated by the Deuthsche Lufthansa Berlin Stiftung. Its corrugated metal skin makes for an interesting photo subject! 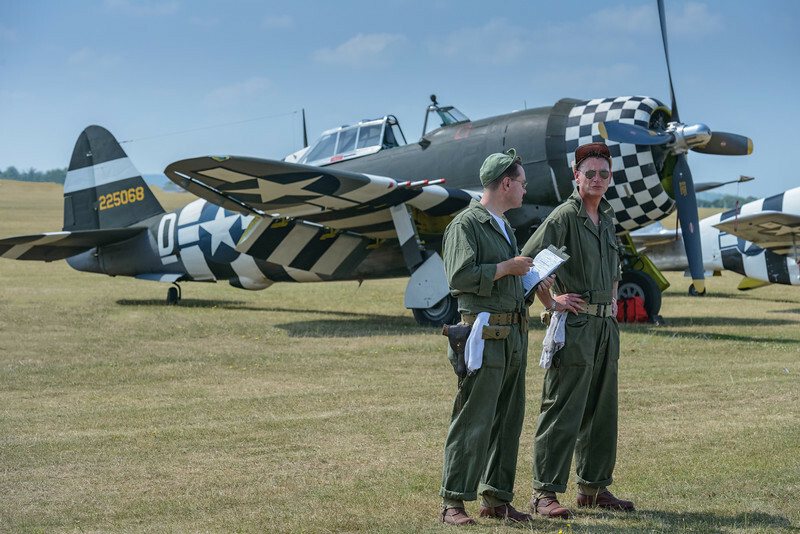 One of the more unique parts of the "flight-line walk" experience, is the fact that people dress up in World War 2 costumes in front of the aircraft. These two mechanics, fit in very well with the US P-47 Thunderbolt in the background. Unfortunately all is largely backlit until well after lunchtime. Another disadvantage of the setup at Duxford is that fact that the visiting GA aircraft (including ours) are parked at the opposite site. 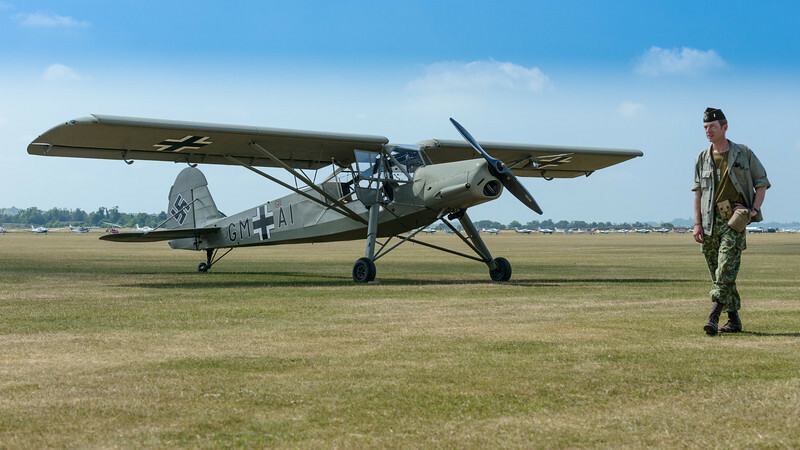 These "modern aircraft" often spoil the shot, illustrated in the image of a German WW2 Fieseler Storch above. During the photo-editing process, I've therefore spent a lot of time removing these disturbing background factors. 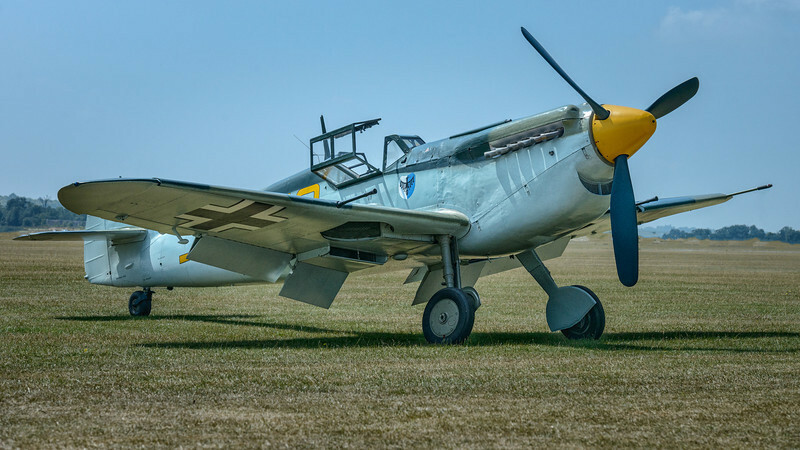 The image of a Messerschmitt Me109 is just one example of this! 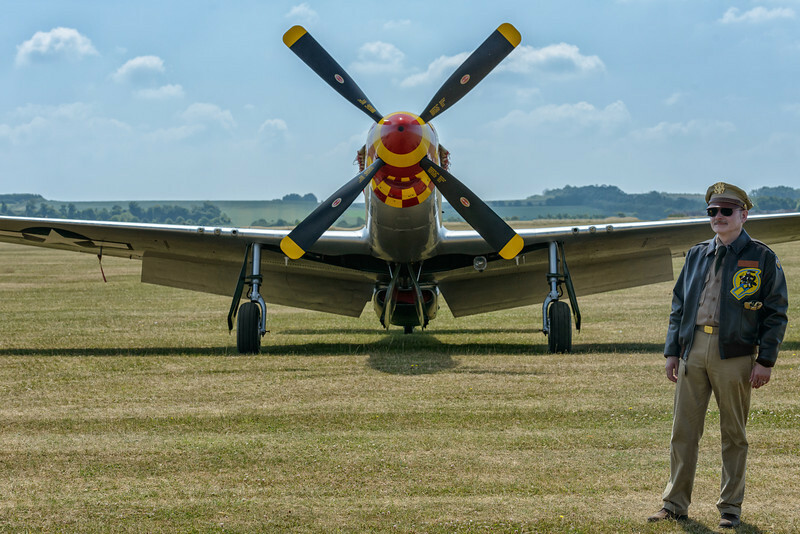 I'll finish the first part of this blog series with a Belgian gentleman, posing in front of a P-51 Mustang. In part 2 (due early next week), I'll concentrate on the flying displays as well as some final thoughts. Meanwhile please visit my "Flying Legends" gallery, for more aviation photography! My 18 day Summer break in my homeland Belgium is slowly coming to an end... I've been able to do a fair amount of "light aircraft" flying, including a trip to the French city of Le Touquet, along the coastline, West of Paris. On the return sector, my wife steered the Cessna C172 along the Côte d'Opale and I managed to frame the above image of the rugged coastline at Cap Blanc Nez through the open side window. 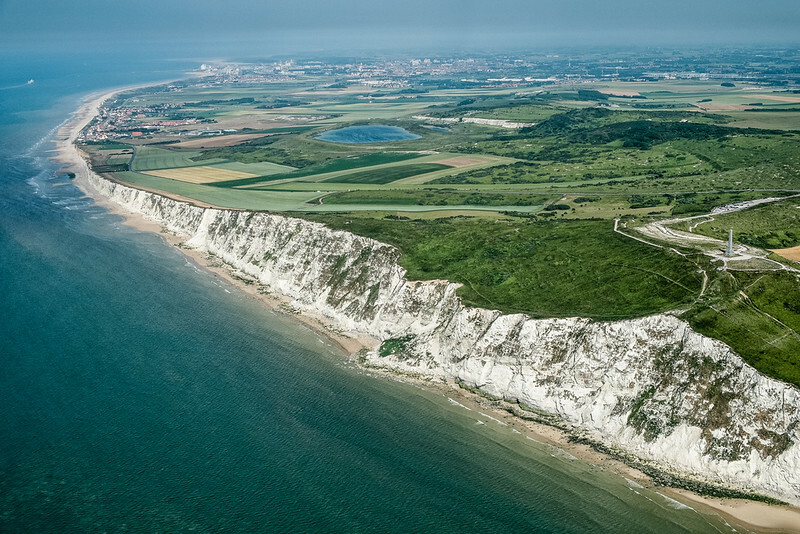 These spectacular cliffs of white chalk are very similar to the white cliffs of Dover on the other side of the Channel. Even though it is nearby, it is not the closest point between France and the UK; which is Cap Gris Nez to Dover. Even though it was only the second time I took my FujiFilm X-E1 on an aerial photography trip, the little camera did not disappoint! 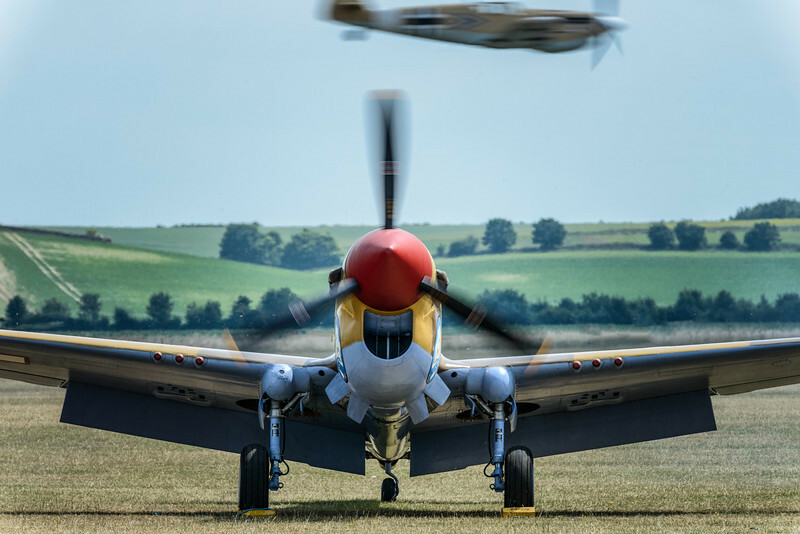 The "Flying Legends Airshow"in Duxford, UK has been on my bucket list for a long time! This weeks Pic(k) of the week is a teaser from this great aviation event which will be covered in an entire blogpost as soon as the photo editing is complete. Asking anybody with the slightest interest in aviation if he/she can identify a Spitfire, the answer will more than likely be positive. 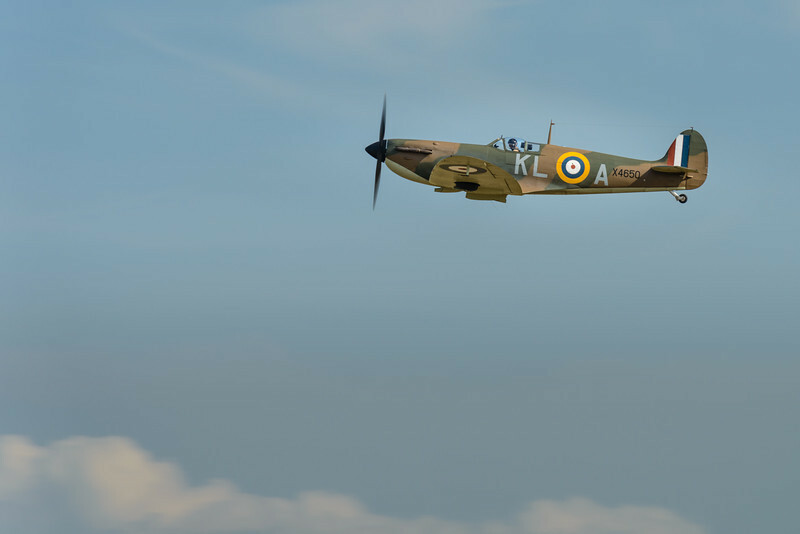 Far less known and often confused with the Spitfire, is the Hawker Hurricane. What makes it even more remarkable is that the Hurricane far outnumbered the Spitfire during the famous Battle of Britain; in absolute numbers as well as in the number of victories. Of the 14533 Hurricanes built only a dozen are still airworthy, while about 50 Spitfires are still in flying condition today. The Hurricane I photographed above is one of only a dozen still in flying condition. 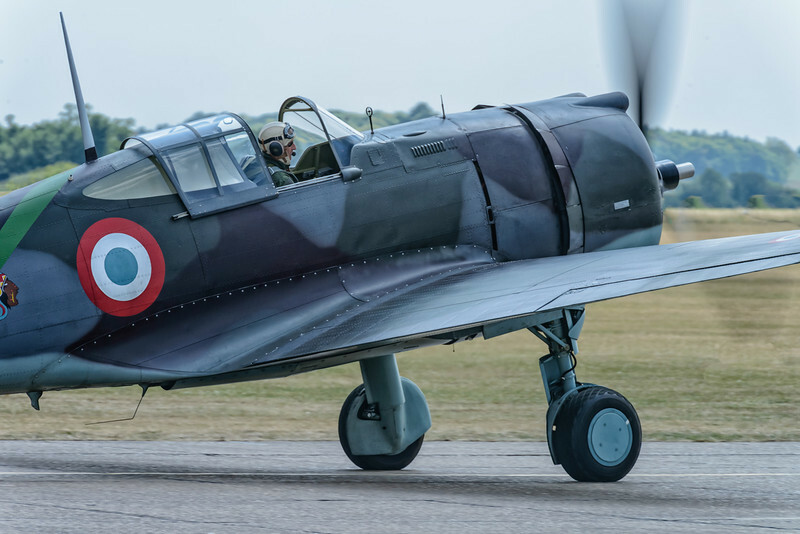 This particular one is the only airworthy one that participated in the Battle of France, illustrated by the French flag on its tail. The lower wings have a special paint job that was used in the beginning of the war to make friendly aircraft recognition easier ; one in white, the other one being black. Hurricane P3351 crashed twice during its WW2 flying career; once near Prestwick, UK, the second time near Murmansk, Russia. After recovering the wreckage in 1991, New Zealander Sir Tim Wallis, set up a joint venture between a British and New Zealand company to start a very long and intensive restoration process. Almost 60 years after its last flight, P3351 took to the skies again early January 2000 at the Christchurch airport. Unfortunately the aircraft wasn't flown much over the last 5 years in NZ and earlier this year a private person in the South of France bought the aircraft and after a complete inspection has made it back into flying condition. The full history of the aircraft can be found here. Seeing the aircraft in its original habitat at the old WWII airport Duxford was a joy! Lets hope we will see the aircraft more frequently in the European warbird/vintage circuit over the coming years! This weeks Pic(k) of the week comes from the underground. 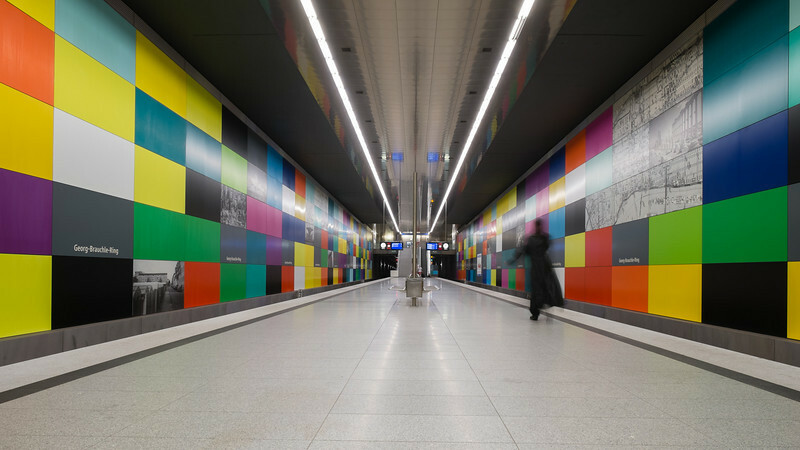 While in Munich two days ago, I photographed this "ghost" deep under ground in one of the U-Bahn stations... No, not really! I do however like how the single person dressed in black adds to the shot. The best way to have very few people in the shot, is waiting until the train has just left the platform. Often there is very short period where the platform is empty. Over the next few days, I will upload more images of different stations to my Munich gallery. I'm off on a 18 day Summer holiday to Belgium now and hope to do a fair amount of photography during that period. Meanwhile, " Take that lens cap off!" Rome, the capital of Italy, is often regarded as the birthplace of Western civilisation. While the city's history goes back more than 2500 years, the state of some of its buildings varies quite a bit; all the way from ruins to very well maintained prime examples of Roman architecture. 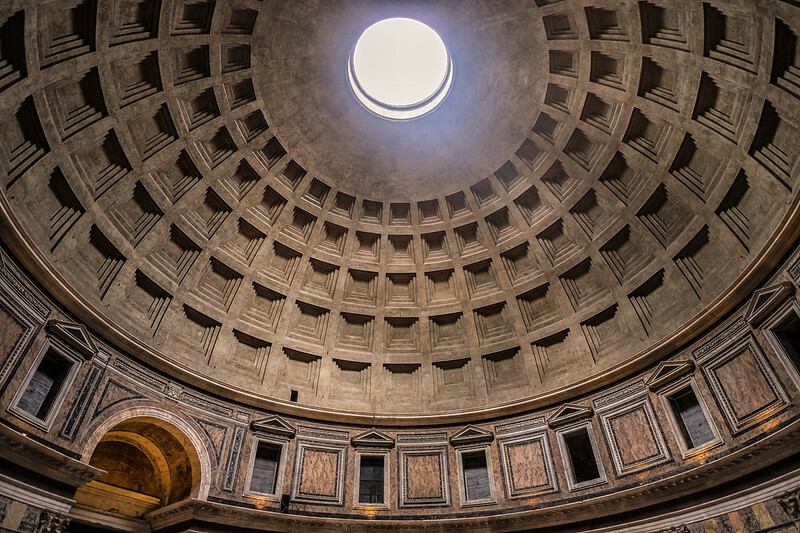 One of the best preserved ones is the 2000 year old Pantheon. The Pantheon, "Temple of all Gods", has been in continuous use throughout its history and has been used as a Roman Catholic church since the 7th century. Until today its 43.3 m diameter dome holds the record for being the largest unreinforced concrete dome. Until today the role of the Pantheon remains somewhat uncertain. It is however clear, that the way how the sun rays shine through the 8.2m oculus, plays a vital role in the building design. One day a year, normally April 21st (happens to be my mums birthday), the beam fully illuminates the entrance at midday. More of my images of Rome, can be found here. Remember, "Rome wasn't built in a day"